Today, probable 2016 Republican Presidential hopeful Rand Paul told a crowd in Iowa that "Nobody here" was trying to ban birth control. Either Rand Paul has a terrible memory, or he has such low self esteem that he considers himself "nobody," because just last year, Rand Paul cosponsored a bill that would have banned certain forms of birth control. 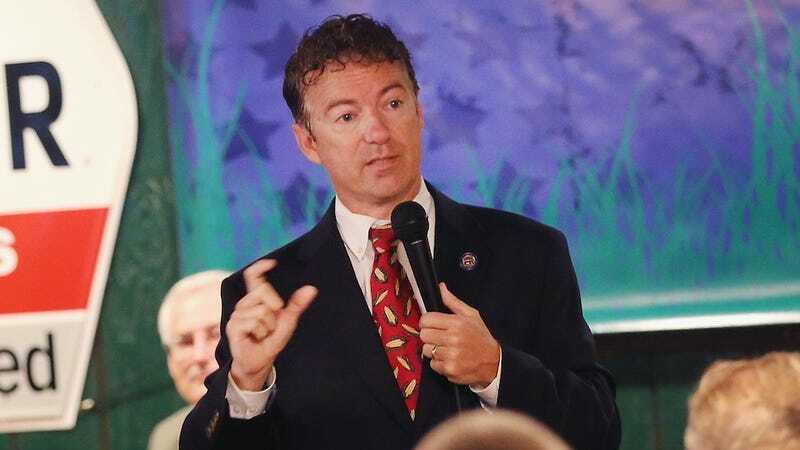 Rand Paul has repeatedly tried to restrict women's access to healthcare and sponsored legislation that could ban some of the most commonly used forms of birth control. Paul introduced personhood legislation that could ban many forms of contraception, he was a cosponsor of the Blunt Amendment and praised the recent Hobby Lobby decision allowing employers to deny female employees access to birth control. Rand Paul's comments this morning are not only disingenuous, there are patently false. Female voters in Iowa, and across the country know where he stands – and it's not on the side of women. We're at least a year away from 2016 political shouting to reach a hoarsening volume, but stuff like this and his cartoonishly cowardly dodge from an undocumented immigrant yesterday only further proves that Rand Paul is to the 2016 Presidential Election what non-Bowsers are to Super Mario Brothers. A formidable sub-villain, sure, but far from the Main Boss. Sorry, GOP, but your princess is in another castle.